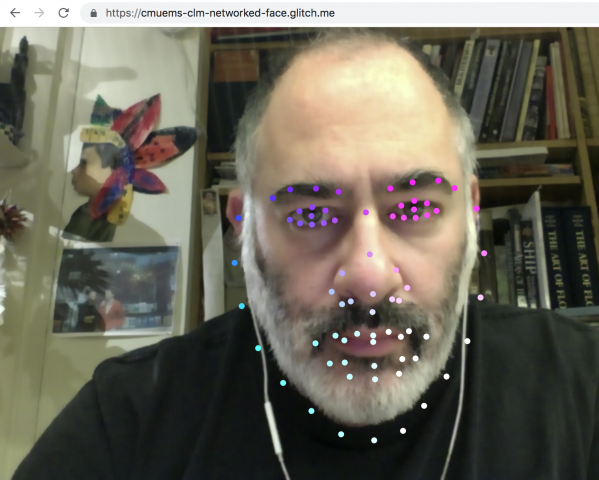 Allows people to communicate their face data in a shared virtual space. This lecture includes many contributions from NYU Prof. Tega Brain, friend and collaborator. Today, we participate in synchronous video calls with Skype and FaceTime, collaboratively edit documents in Google Docs, and build multiperson virtual environments in MineCraft. These systems and processes are part of the fabric of everyday life, but it hasn't always been so, and it's worth stepping back and thinking about the use of networked telecommunications in media arts. 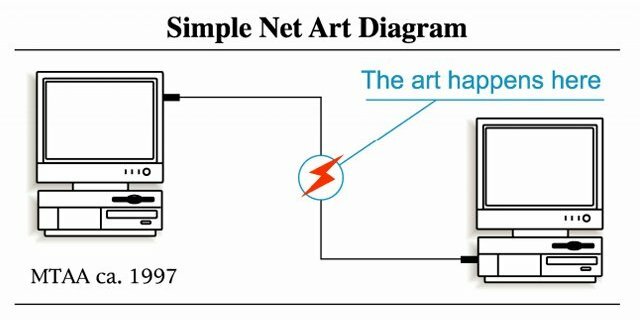 As is often the case, some media artworks from the past presaged common tools today... and others represent intriguing dead-ends in the history of attempts to devise new modes of communication. The Cave of Forgotten Dreams by Werner Herzog (we will watch from 29:58 - 32:45). Regarding two artists, 5000 years apart, who 'collaborated' on the same drawing, Herzog remarks: "We are locked in history, and they were not." Cairns are human-made piles of stones. 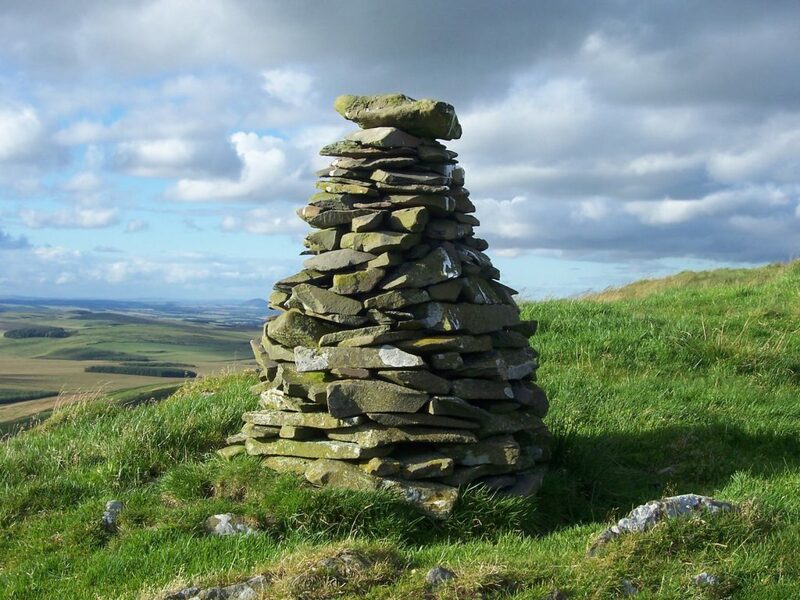 Cairns have been and are used for a broad variety of purposes, from prehistoric times to the present, often as landmarks, memorials and trail markers. It is a collaboratively created structure, built one stone at a time, often over the course of centuries. So how did we get from there, to ...here? Agar.io and the related Slither.io are compelling multiplayer games that are astonishingly well-tuned. Very different strategies are required depending on one's current size/score. The first use of telecommunications as an artistic medium occurred in 1923 when the Hungarian constructivist artist László Moholy-Nagy made Telephone Pictures. 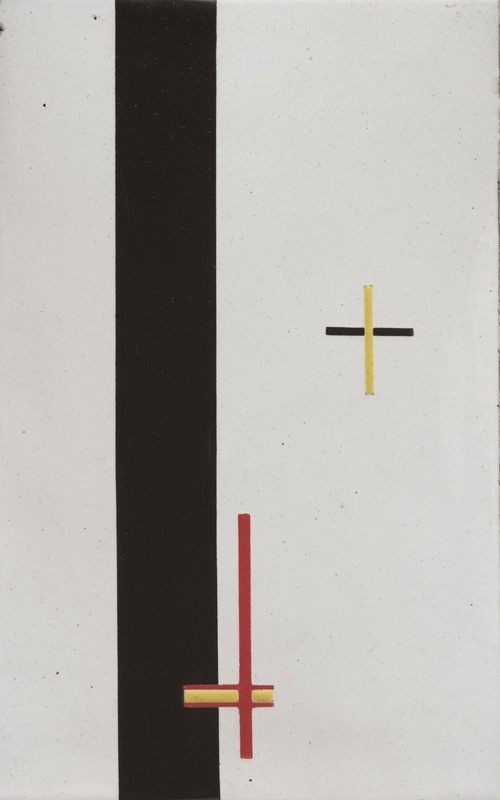 These works questioned the idea of the isolated individual artist and the unique art object. Myron Krueger's landmark VideoPlace (~1972-1989) was a 2D artificial reality that enveloped its users, and responded to their movements and actions, without the use of encumbering goggles or gloves. 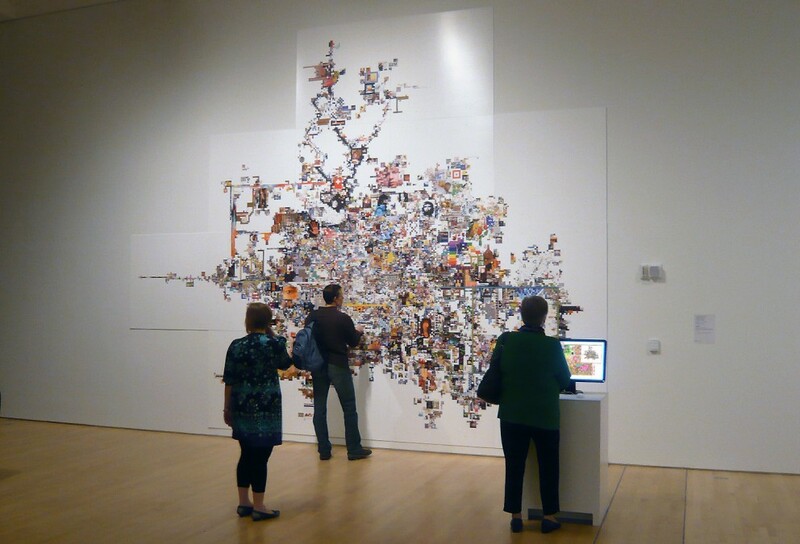 One of the first interactive computer artworks, it allowed participants in different locations to share a common virtual space -- even, at different scales. 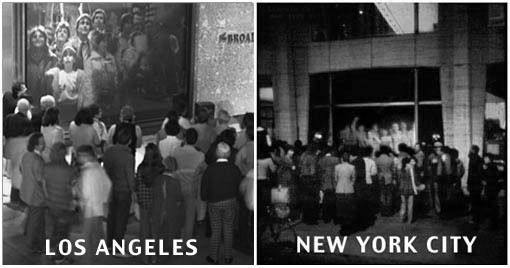 Hole in Space (1980) was a "communication sculpture" by Kit Galloway and Sherrie Rabinowitz, which used live two-way video to connect street-level audiences in Los Angeles and New York City. "On a November evening in 1980 the unsuspecting public walking past the Lincoln Center for the Performing Arts in New York City, and «The Broadway» department store located in the open air Shopping Center in Century City (Los Angeles), had a surprising counter with each other. Suddenly head-to-toe, life-sized, television images of the people on the opposite coast appeared. They could now see, hear, and speak with each other as if encountering each other on the same sidewalk. No signs, sponsor logos, or credits were posted--no explanation at all was offered. No self-view video monitors to distract from the phenomena of this life-size encounter. [...] «Hole-In-Space» suddenly severed the distance between both cities and created an outrageous pedestrian intersection. There was the evening of discovery, followed by the evening of intentional word-of-mouth rendezvous, followed by a mass migration of families and trans-continental loved ones, some of which had not seen each other for over twenty years." The Poietic Generator is a social-network game designed by Olivier Auber in 1986. The game takes place within a two-dimensional matrix in the tradition of board games and its principle is similar to both Conway's Game of Life and the surrealists' Exquisite corpse. 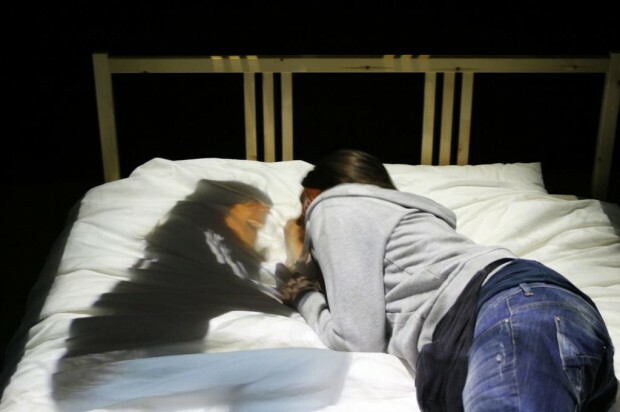 In The Trace (1995), an interactive installation by Rafael Lozano-Hemmer, a participant encounters the moving, ghostlike "presence" of another person, who is located in an identical but separate room. Their presence is conveyed by a glowing spot created by a pair of intersecting beams of light. Ken Goldberg & Joseph Santarromana's TeleGarden is an art installation that allows web users to view and interact with a remote garden filled with living plants. Members can plant, water, and monitor the progress of seedlings via the tender movements of an industrial robot arm. The Telegarden was developed at the University of Southern California and went online in June 1995. In its first year, over 9000 members helped cultivate. In September 1996, the Telegarden was moved to the lobby of the Ars Electronica Center in Austria, where it remained online until August 2004.
inTouch (Scott Brave & Andy Dahley, 1998) -- an experiment in telepresent haptics, allowed two people to communicate through shared movements of a set of wooden rollers. 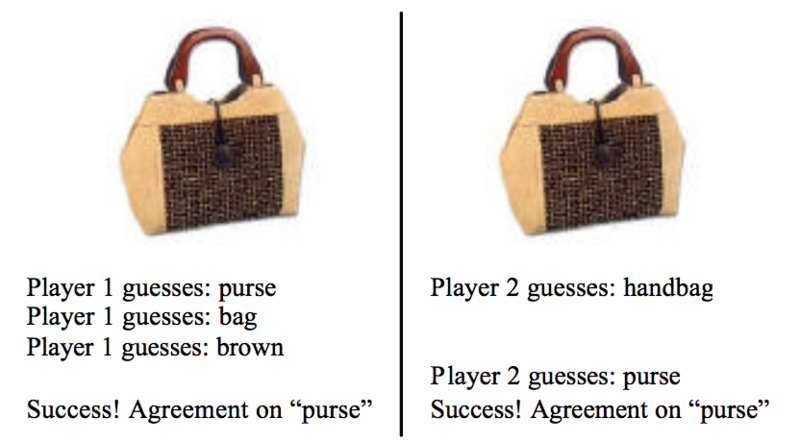 In 2004, Luis von Ahn and Laura Dabbish developed the "ESP Game", which was later (2006) developed into the "Google Image Labeler". The foundational concept of gamifying the elicitation of intersubjectively valid labels for images, eventually would underpin a wide range of technologies, like CAPTCHA, for labeling images and (more importantly) creating terascale datasets for training machine learning algorithms. Studio Moniker's Do Not Touch (2013) [live version here] is a music video created from the crowdsourced movements of its viewers' cursors. 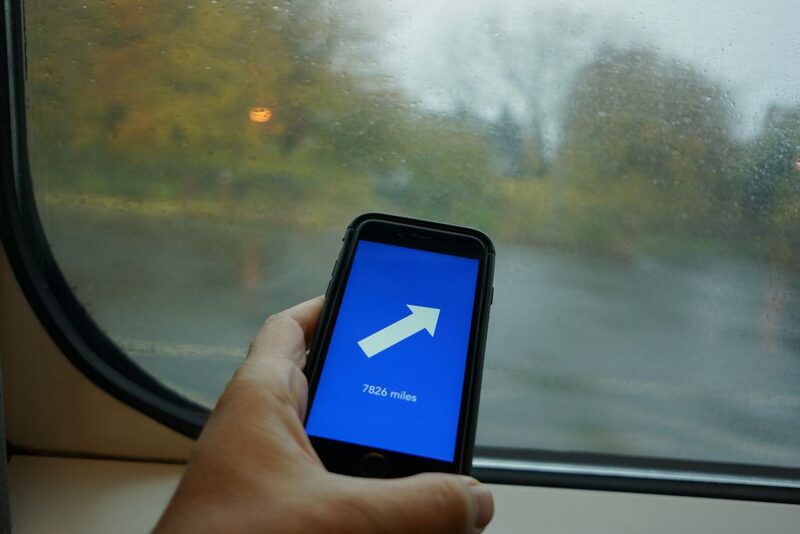 the space between us (2015) by David Horvitz is an iOS app which connects two people's phones. Once connected, the app displays the distance and direction to the other person. 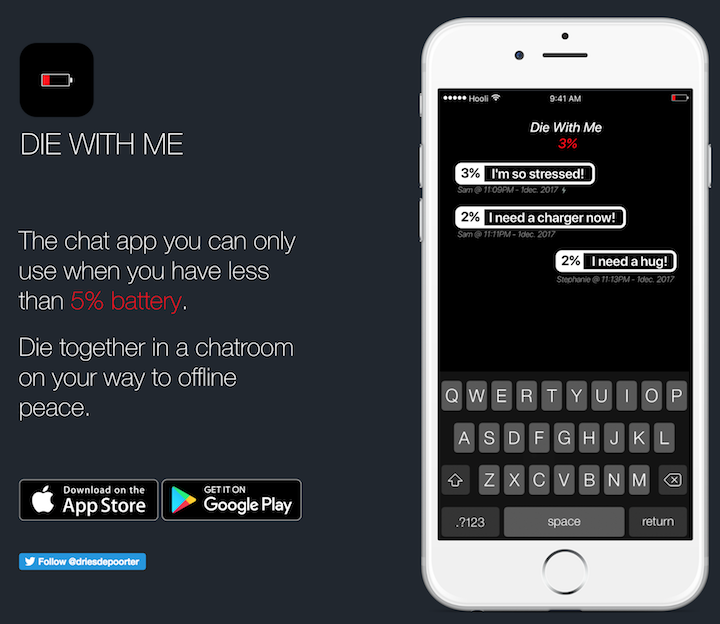 Dries Depoorter and David Surprenant developed Die With Me, a chat app you can only use when you have less than 5% battery. "Die together in a chatroom on your way to offline peace." Pasties - A chatroom in which participants communicate exclusively by copy-pasting. Bilal, Wafaa. Domestic Tension (2007). 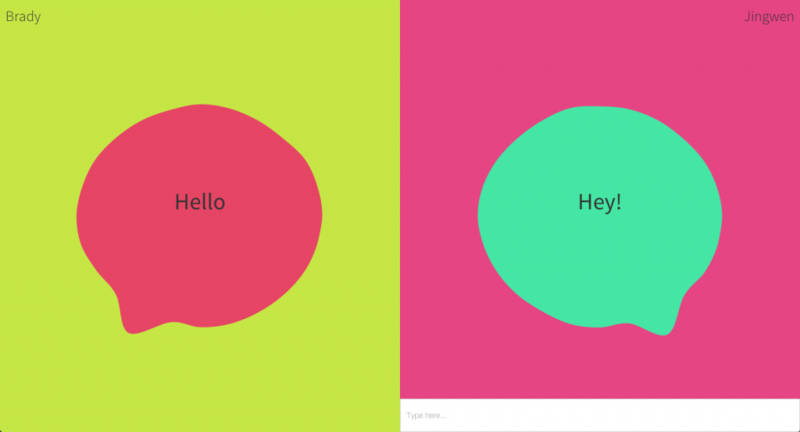 Viewers log onto the internet to contact the artist, or to shoot him with a paintball gun. Max Hawkins, Call in the Night (2013), "An experimental radio show and telephone network documenting the nighttime experience. Anyone with a phone can participate for free." Soledad Penadés, Chat.meatspac.es. 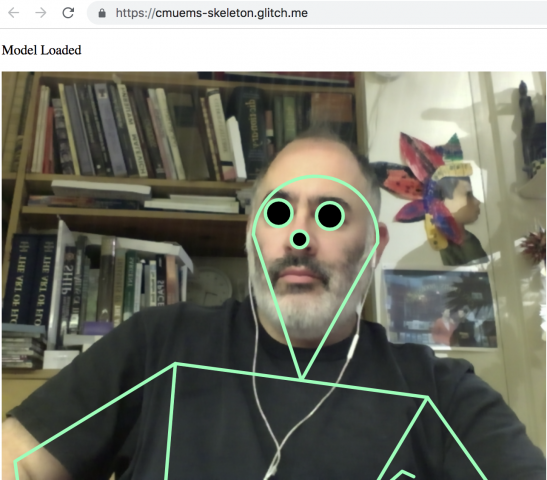 (2014), allows 'chatting' with small webcam GIFs. Exonemo. The Internet Bedroom (2015). A sleepover in Google Hangouts.